Imagine how cool it would be if you had a job where you got to lay on your back all day and make money. Now, get your head out of the gutter (or think about it for a while … and then get your head out of the gutter) and keep reading. It might sound like something you could only do in space, but this Aluminum Laptop Desk will have you defying gravity in no time. It’s true. Lie down and lock the legs into place – each leg has three self-locking joints to make sure your Aluminum Laptop Desk is at just the right angle. Since it’s aluminum, it also helps draw heat away from your laptop. It folds flat for easy storage, has a shelf (with clip on plastic bumpers) to keep your laptop from sliding off, and sets up in seconds. And, if you’re one of those folks who prefers standing while working, plop your Aluminum Laptop Desk on your regular desk, and you are a few clicks away from a very comfortable standing solution! I like standing desks from time to time… I also like being able to change it’s position, and even just take it with me, so when I saw this small laptop desk a few months ago, I ordered it right away. 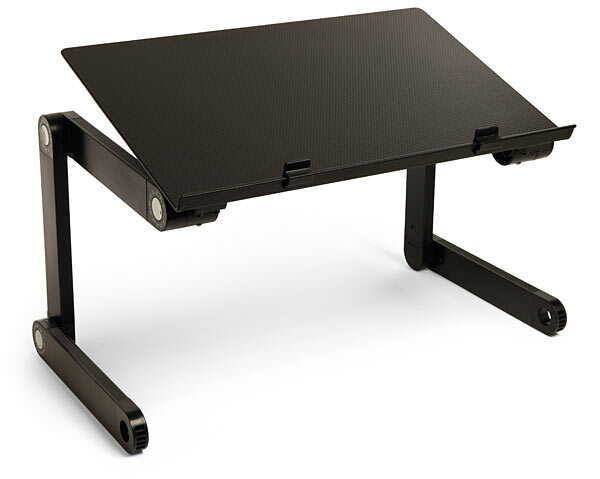 It’s legs adjust nicely for various heights and positions, from a regular laptop stand to a standing desk sitting on a table or regular desk. I’ve actually found myself bringing this handy desk with me to presentations, so I just have to adjust the legs, and instant podium..